I remember the first time that Leigh Ann and I met with the therapists from the Early On program here in Ottawa County. We really did not have any idea about what to expect; even so, we were filled with some very strong, mixed feelings. We wanted the best for our little boy and did not want to wast anytime so we were thankful for the opportunity to start helping him but we were also feeling sad and alone because we still were not sure why our kid was given the extra chromosome. Even more than that, we wanted to make sure anyone that was going to interact with Treyton understood what a gift he was. We also were concerned about any labels that would be placed upon him as well as him being thrown into some group simply based on a diagnosis. We wanted to make sure that he was seen for the unique individual that he was and is. I would love to say that we got used to having the therapists in our house but we never really did; we became more comfortable with them but I would never say we got used to it. They were very nice people and were usually helpful. The issue is that the entire process can be an unsettling and frustrating experience at times. We would have a formal meeting about every six months to review a list of goals, see how Treyton had progressed toward those goals and then set some new goals. Treyton did not mind this process, I think he liked all of the attention and probably just considered the visitors to be new people to play with on occasion. That was not the case for his mom and me. We struggled, at times it seemed like the therapists would reduce our bundle of joy down to a few scores. I tried to come home from work as often as I could when the therapists were scheduled to be there but in reality that was just a small percentage of the time. As a result I could usually expect a phone call from Leigh Ann after they left so she could give me the “lowdown.” More times than not she would express some frustration over something that Treyton could do but chose not to do when the therapist was there. As a result they would mark down that it was a skill he could not perform. If we were lucky they would put an asterisk next to the skill with a note saying that his parents claimed he could perform the skill but that often seemed patronizing. Now that Treyton has moved out of the Early-On Program and goes to preschool we no longer have therapists coming to our home but we are still very involved with evaluations and the measurement of Treyton’s skills and abilities. This is a process that will continue for a long time. When I came across the information about evaluations and how to help your child perform his/her best during them I thought it was important enough to share. 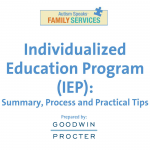 Nearly all of the information that follows was gleaned from Libby Kumin’s book Early communication skills for children with Down syndrome: A guide for parents and professionals. It may be a difference in the way the two genders approach things or maybe it is just personalities but as a general rule my wife seems to experience more stress than I do when it is time for Treyton’s evaluations. I think part of it is that she is around him everyday and is diligent about working with him on various skills and goals. I think at times it may feel like she is being evaluated. The truth is, I do feel like the entire evaluation process puts your parenting skills under the microscope. I don’t think that is anyone’s intentions but it is a byproduct of the process. Also, the evaluation process is a very tangible reminder that our child is not typical, he has special needs. When Treyton is at home he is a normal part of our family. When he goes to school he gets classified as having special needs; that can be a very difficult reality. I refuse to give a damn that my kid has Down syndrome, Treyton is my son and he is who he is. Still, I want him to cooperate during his evaluations so that the professionals can get an accurate reading of where he is at so they can create a good plan to strengthen is areas of weakness. That alone can be stressful. It helps, however, to keep in mind that testing opens the doors to treatment. There are a lot of things that can add to the stress you feel surrounding your child’s evaluation. As already stated, your child’s cooperation will be a key factor in the measurement as well as one of the most unpredictable factors. You have your own feelings and struggles with the idea of being a part of the “special needs world.” Part of the baggage of being in this “world” is know that your child is not considered typical. You have come to see the unique talents and gifts your young child already has and you want others to see those as well. Sometimes those talents will show up on a test but other times they are talents that are not measured by the assessments – that is frustrating. There are a lot of things that can add to the stress we feel as parents; we need to learn how to minimize and control those triggers so that we can help our children as much as possible. I don’t have any type of legal training or expertise but recently I became aware of some things that I had not known before that could be helpful going forward. 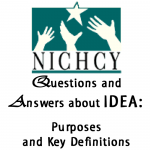 The Individuals with Disabilities Education Act (IDEA) is something with which a parent of a child with special needs should become familiar. According to the IDEA, the first evaluation a child receives should cover all areas of suspected disability. For a child with Down syndrome this will include several different areas but should almost always involved speech. The IDEA also requires that testing be done in a child’s usual form of communication. This becomes especially important for non-verbal kids that are reallying on total communication systems. If a parent suspects that their child needs to be reevaluated or maybe evaluated in an area that has not yet been tested, they can make that request directly to the professional. The IDEA allows the ability for parents to make direct referrals for evaluation without going through another party. Part of the reason for this allowance is the recognition that parents usually have a very good handle on their child’s ability. These types of requests can be made because the parent is curious where the child is currently at in a particular area. Maybe the parent wants a second opinion or possibly feels that the evaluator has some type of motive that is skewing the results. If the request for evaluation is made within the school system it should be at no cost to the parent, however, if seeking an evaluation outside of the usual special education system it may require insurance or out-of-pocket expenses. Another parental provision of the IDEA is the right for a parent to supply supplemental information for the evaluation. Kids are most comfortable in their home environment so they will often do more there than they would when being evaluated. In such a case it may make sense to provide a video or audio recording or some other representation of your child’s ability. Both the parent and the evaluating professional want to get the most accurate evaluation possible. In order for that to happen we need to understand the things that will negatively impact our child’s performance. The two areas that I see as most crucial the factors affecting the child’s health and environmental circumstances. In terms of health, the child it is pretty basic. The more rested the child is the better; that’s the case for all of us. As parents we do have some control over the amount of rest a child has but it can be more difficult to control illness. If a child has a cold or some common virus s/he will “drag” through the evaluation. Ear aches and or infections will certainly impact the speech and hearing portion of an evaluation. When talking about environmental circumstances we are looking at the location, the person doing the evaluation, and the types of activities involved. At best, a child in an unfamiliar location may be curious and want to explore which means they will not be focused. On the other hand they simply may be nervous and unsure of the new surrounding. It is a similar situation with the evaluator. Kids need to be familiar with the adults that are working with them in order to be at their best. Lastly, boredom will lower a child’s performance during an evaluation. If the types of activities being used to evaluate the child are not of interest, it’s not very likely the kid is going to respond well. On more than one occasion I have told the therapists and professionals working with Treyton that they will need to outsmart him. After all, he is my kid so if I am wondering why you want him to do what you are asking I am sure he is also wondering why. The length of the evaluation can increase the chances that a child will get bored and lose interest as well. If there is one thing you can take away from this article I hope it is the importance of speaking up. As a parent you know your child better than anyone else and you also care about them more than anyone else. Advocate for your child. If you have doubts, questions, comments, or whatever, make sure you voice them. The most important thing about an evaluation is getting an accurate assessment of your child’s abilities and needs; without that your child will not get the help s/he needs. Helping your child give an accurate picture of his/her abilities begins when the evaluation gets scheduled. Start asking questions right away so that there will not be any surprises. Ask a lot of questions, make sure you know WHO, WHAT, and WHERE. You want to know who the person is that will be conducting the evaluation. Is your child comfortable with that person? What is being evaluated? What methods will be used to measure your child’s abilities in these areas? Will the evaluation take place in a familiar place? If not, maybe you and your child can visit the location ahead of time in order to reduce some of the unfamiliarity. Along with making sure you ask questions, be generous with the amount of information you provide; a solid background on your child will help the evaluator adjust his/her methods in order to get the most accurate evaluation possible. If you asked the questions mentioned above you should have a good idea of the types of exercises your child will be doing. Offer suggestions about the types of things your child will most likely respond well to. Knowing that your child likes certain things or dislike others will make the evaluation flow much more smoothly. There are some other things you can do as well to help with your child’s evaluation. First, always ask if you can observe. You don’t want to be a distraction but in many cases the evaluation room will be setup to allow for observers. Your goal in observing will be to judge whether or not the evaluation was a good measure of your child’s ability. Make sure to speak up if it is not. Also, as stated earlier, the IDEA allows parents the opportunity to provide supplemental information. Given the difficulty of getting kids to cooperate this is a great way to show your child’s capabilities. If you did a good job of gathering information about what is being evaluated you should be able to make some short videos of your child that will help the evaluator. I put together a short video clip of Treyton as an example of the type of video you could use. This clip shows some of his imaginative play as well as his use of sign language to communicate. You will see him ask to watch Big Bird and Snuffy on my phone. When I confirm what he is saying he shakes his head yes. The type of supplemental information you provide will depend on what is being evaluated. I wouldn’t be shy about this, even if it doesn’t provide anything new it won’t hurt. Make a habit of recording your child in this way and create a portfolio of sorts that is available when you need it. By having the information available it will take some of the pressure off when an evaluation is approaching. When Treyton was an infant and the therapists were visiting our home still, I remember the stress Leigh Ann and I would feel each time we would get the evaluation form handed to us. We either felt really good about the report or really bad. Even before we read the report we could feel stress and dread and maybe even some fear. It is an ugly part of our new reality. Even though our other three kids do not have disabilities, had we been required to go through this process with them it would have been stressful as well. It just seems to make it harder knowing that this is another thing that is a result of the diagnosis. Regardless, the end result will benefit your child so you need to choke down your feelings and make sure you do everything you can do to help your child succeed. When in doubt speak up. Never let anyone place limitations on your child’s abilities. Our job as parents is to help our kids be the best they can be; to reach their full potential. Lastly, please consider supporting Treyton’s Posse as we Step Up for Down Syndrome on October 13. We are raising money to help support the Down Syndrome Association of West Michigan which exists to help parents like me and Leigh Ann as we strive to help the world see that kids like Treyton that have Down syndrome are an important part of our society and need to be valued for the treasures, the Four-Leaf Clovers that they are.